SeaTrac co-founders Buddy Duncan and Jigger Herman prepared to launch their boat. Nothing seems out of the ordinary when the 14-foot boat is lowered into Marblehead Harbor from the Pleon Yacht Club pier. That is, until it’s low enough for onlookers to see the deck, which is flat except for antennae in front of a black array of solar panels. When the driverless boat hits the mouth of the harbor and starts propelling over the waves, people gawk, take pictures, and sometimes even report the strange sight to the local harbormaster. 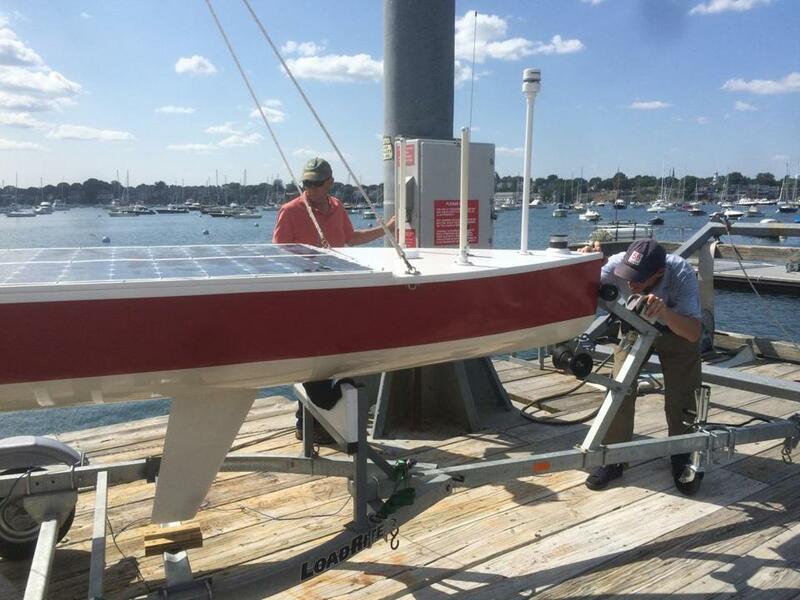 The unmanned, solar-powered vessel was launched this spring by SeaTrac Systems Inc., a four-person Marblehead company founded by ocean engineers Buddy Duncan, 63, and James (Jigger) Herman, 54. Still in the testing phase, it was designed for missions that could last as long as a year. Duncan and Herman “are serial inventors and have been since childhood,” said Alessandra Bianchi, Herman’s wife and SeaTrac communications director. The inventors met 30 years ago at the Massachusetts Institute of Technology, where both earned master’s degrees in naval architecture. They were part of a team that designed “America3,” Bill Koch’s yacht that won the America’s Cup in 1992. They later tapped their inventive skills and founded two companies, each of which were bought by large corporations. Itching for a new challenge, Duncan and Herman dove into the expanding world of robotic marine research. Since its launch in the spring, Duncan and Herman have been in discussions with groups that are considering using the vessel for environmental monitoring, military, and oil and gas applications. In May, when monitoring an algae bloom that makes shellfish toxic to eat, Woods Hole Oceanographic Institution researchers attached an automated underwater microscope to the hull of SeaTrac for a three-week deployment in Harpswell Sound, Maine. The project, supported by several grants, is developing new tools for understanding the dynamics of harmful algae blooms, which are occurring with increasing frequency and severity all over the world, according to Michael Brosnahan, assistant scientist in Woods Hole. The underwater microscope “takes samples of water while the boat is traveling. It’s the reason we were looking at working with SeaTrac,” said Finnick Correia, a research assistant at the institute. While the prototype vessel is still in the development stage, Duncan and Herman’s next step is to get customers and move into production. “We would like to build one by year’s end. After that, 10 to 15 boats per year would be a good result,” said Herman. As for selling SeaTrac, there are no plans. “We are enjoying what we are doing,” said Herman. Bette Keva can be reached at bettewk@gmail.com.